This photo is of six-year-old Ruby Bridges, the first African American child to desegregate an all-white elementary school in the south. The photo was posted on the Facebook page of “A Mighty Girl,” an organization dedicated to raising smart, confident, and courageous girls. But I don’t think there can be a better caption for this photo. I think our culture has the wrong idea of what it means to be mighty. And as a bunch of enemy-loving, Jesus-following, culture-defying Dunker Punks, I think that’s something that we should tackle. So here’s what I think: Ruby Bridges, at six years old, was more mighty than the five big men seen protecting her in this picture. She was more mighty than the crowds of vitriolic adults who those men were protecting her from. She was more mighty than vicious, violent racists of the Jim Crow south like Bull Connor. More mighty than a United States government that for its first two hundred years refused to acknowledge her full humanity, much less her right to go to the same school as everyone else, and in some respects still fails to do that today. More mighty than the Church, which far too many times in American history and in world history has stood on the wrong side of justice and human rights. More mighty than our modern American heroes: our superheroes like Batman and Superman, our war heroes like Chris Kyle and George Patton, our manly men like Arnold Schwarzenegger and Chuck Norris. Yes, I said it. This little six year old girl was even mightier than the great Chuck Norris. Far mightier. Dunker Punks, let’s be counter-cultural. When you hear someone say that something is mighty, challenge that. Mighty of strength, or mighty of heart? Mighty as in dominant, or mighty as in fearless? Mighty as in violent, or mighty as in defiant? The mightiness of a culture that collectively told Ruby Bridges that she wasn’t fully human, that she didn’t deserve full human rights, or the mightiness of Ruby Bridges, who told her culture that she didn’t care what they thought? We have to have the mightiness of children like Ruby Bridges, children so mighty that they didn’t fight with violence, but with determination. Children so mighty that they didn’t stand tall or strong, but firm and sure. Children so mighty that they did not accept the world as it was, but were wise enough to see and create the world as it should be, through courage, and creativity, and imagination. This verse tells me that Jesus had the same idea of mightiness that the Dunker Punks should have. So here’s my last thought for you. We say that our God is mighty. But what does that mean? 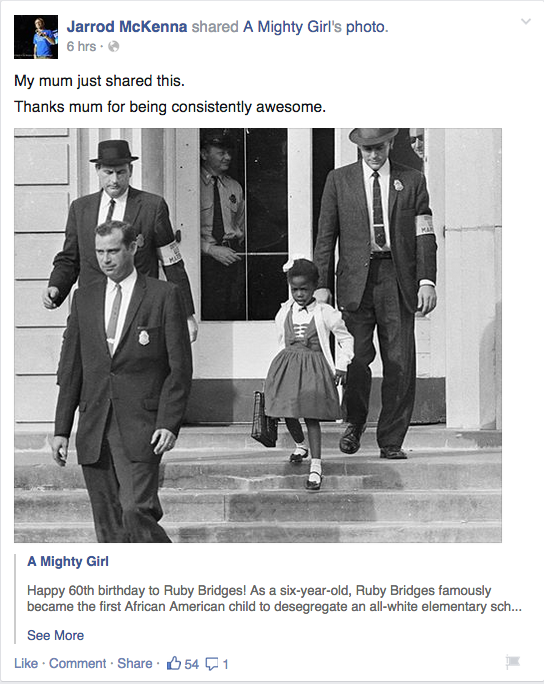 To me, that means the mightiness of Ruby Bridges. To me, that means the mightiness of justice, of peace, of fierce love for our enemies, of tireless grace. The mightiness of God can be seen on the determined face of Ruby Bridges. When we think about God, lets not forget what true might looks like, what true love looks like, what true power and courage looks like. Dunker Punks, as we go out into the world to bring love, to bring change, to look like Jesus to the world, let’s not forget that Ruby Bridges looks more like God, and God looks more like Ruby Bridges, than any image of God our culture would like us to believe.